An Cnoc is the name of the malt produced at the Knockdhu distillery. They’ve apparently switched the brand name of the malt between Knockdhu and An Cnoc a number of times. 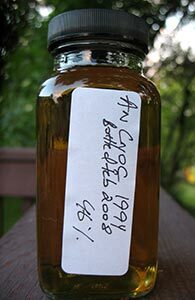 Since the early 2000s, when they re-launched the line, it’s been An Cnoc. The desire is suposedly to avoid confusion with the Knockando distillery. The possibility of confusion seems mostly academic to me, really, as Knockando barely put out any malt either and are probably no better known to the general populace. The greater true confusion may be whether this distillery is in the Speyside (which is where a number of people put it) or in the Highlands (which is where the Scotch Whisky Association puts is). The whisky itself is less confusing; I’ve only had a few and they’ve all presented simple, direct pleasures: none approaching greatness, all solid. That includes this 1994 vintage release from 2008.